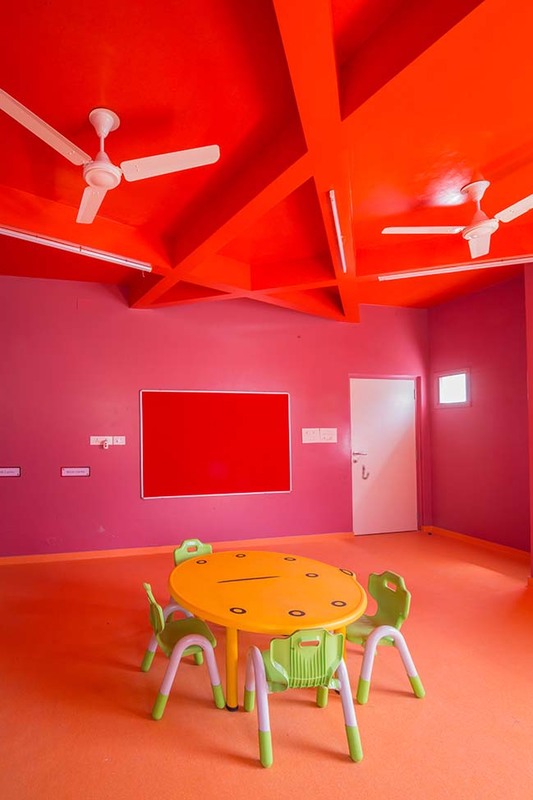 Renesa Architecture Design Interiors's design ideology to this pre-nursery school raises an argument to the new style of architecture (A Renaissance of Art) for the learning and growth of the little ones. 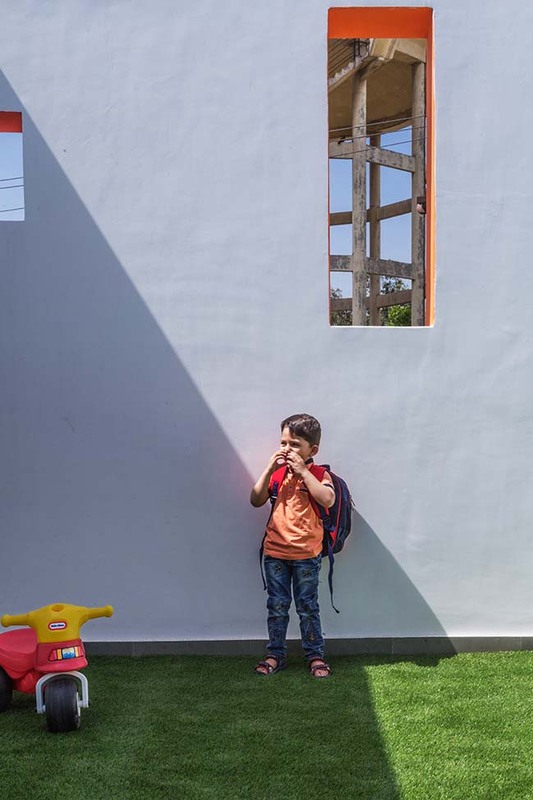 The idea behind architecturally treating this dilapidated space was to create a reaction and response from a young one in order to make them learn from the exterior environment. 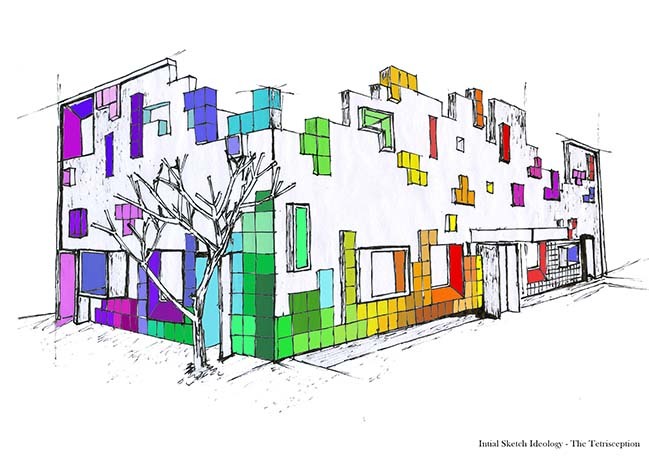 From the architect: Learning environments are ever growing and changing. 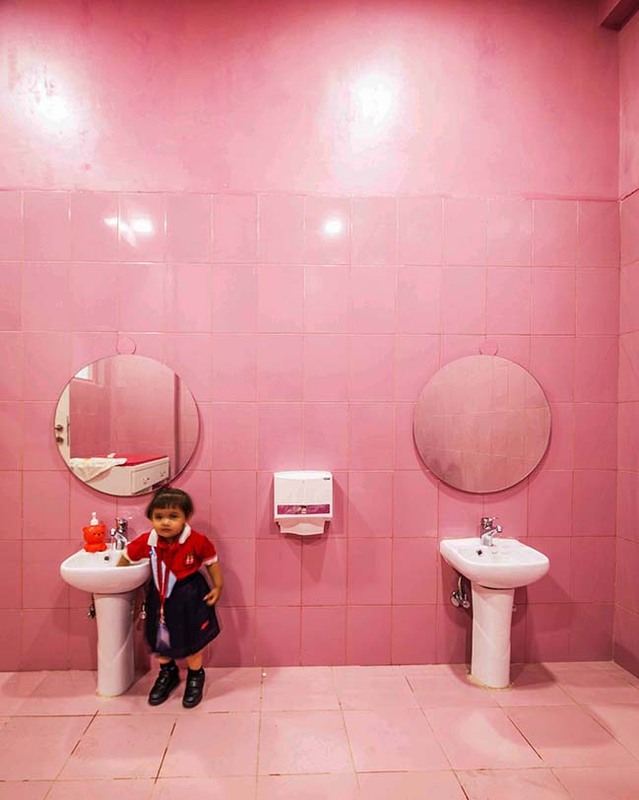 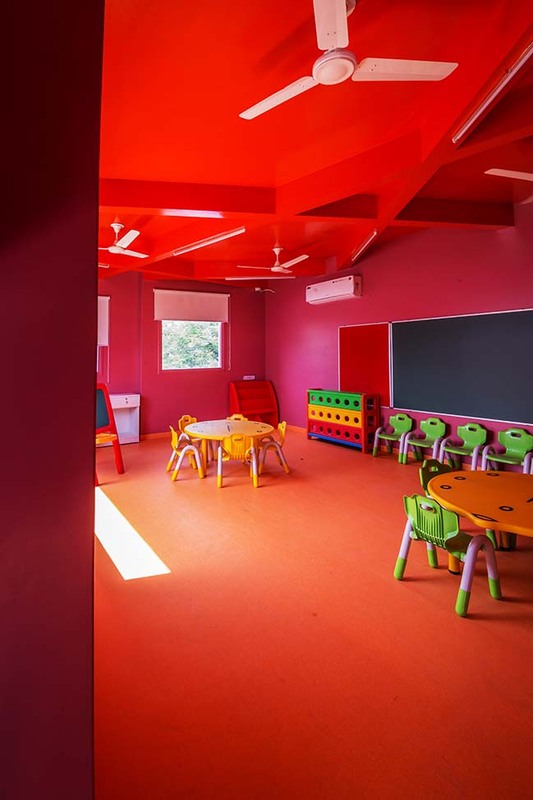 There is a growing awareness among societies and culture for pre-schools to be diverse and provide learning environments through the built form. 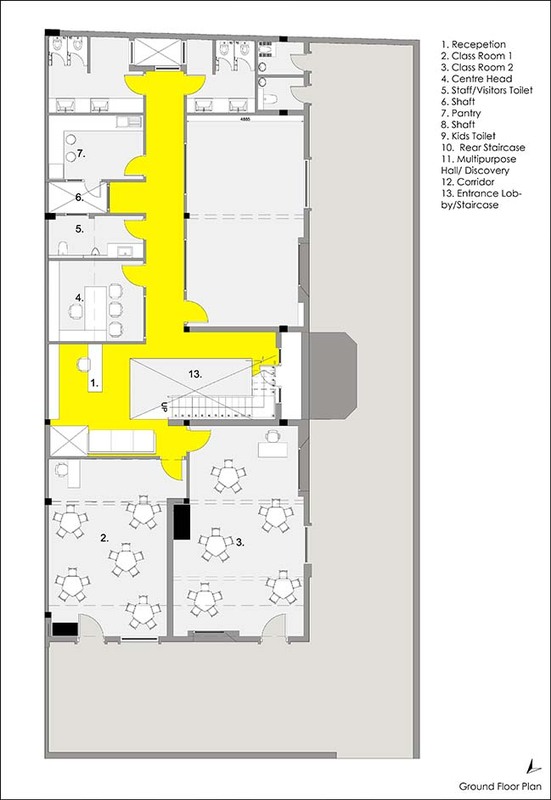 As learning spaces re-focus on team-based, interdisciplinary learning, they are moving away from standardized , one-size-fits-all approach to teaching. 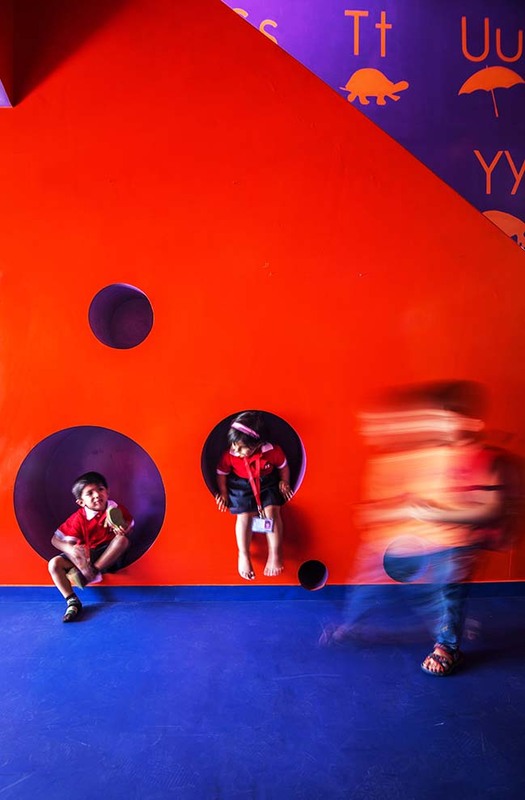 Instead, it is becoming a norm that students learn in a variety of ways, and the differences be supported. 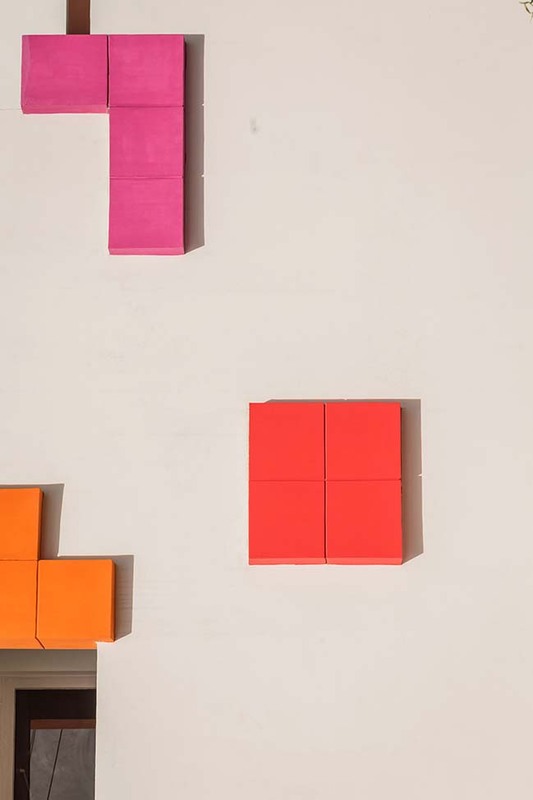 Students often learn better by doing it themselves, so teachers are there to facilitate, not just to instruct. 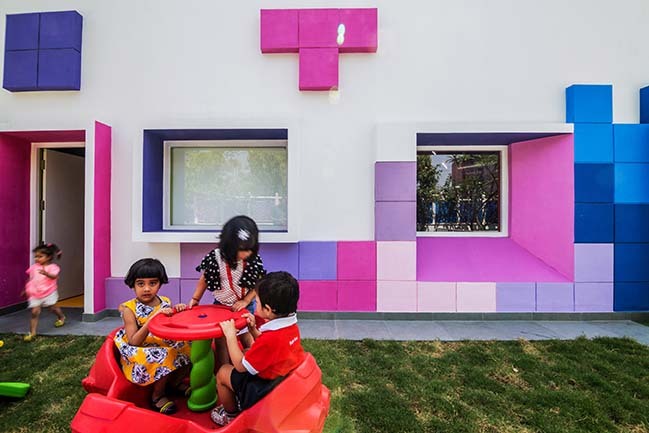 Here, the built Tetris-ized environment becomes an enabler and a catalyst to nurture the young minds of pre-school students. 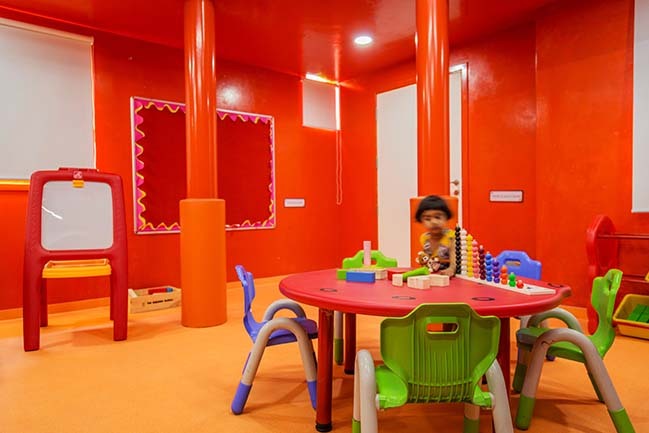 Montessori education is an interactive model of learning that emphasizes on independence , freedom within limits and respect for a child's natural , physical and social development. 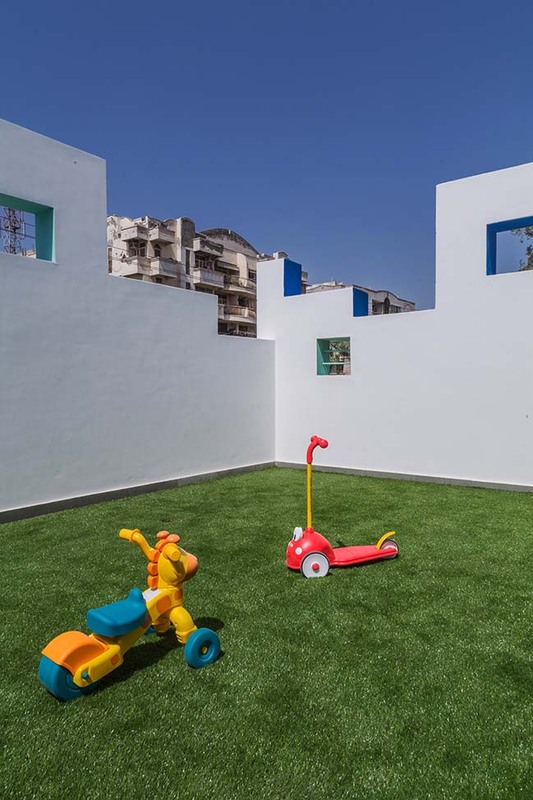 Renesa Architecture Design Interiors has proposed a method to know children fully and respect their development, so that education accompanies the natural process of life. 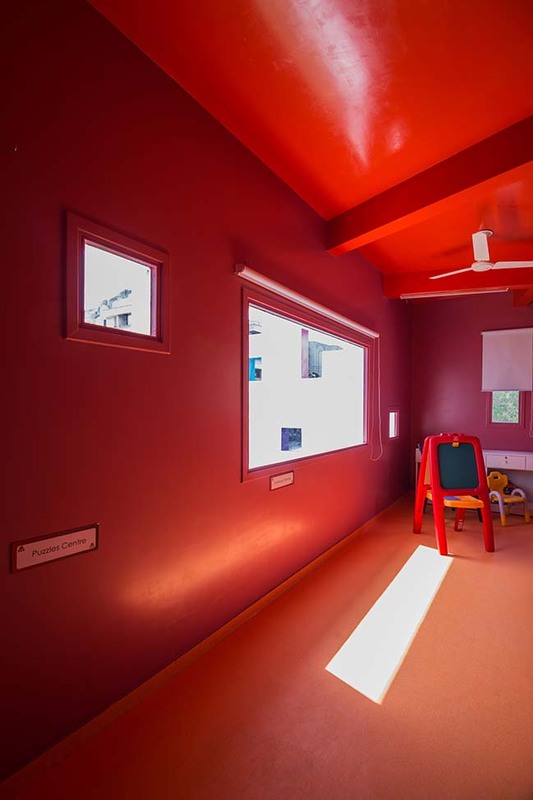 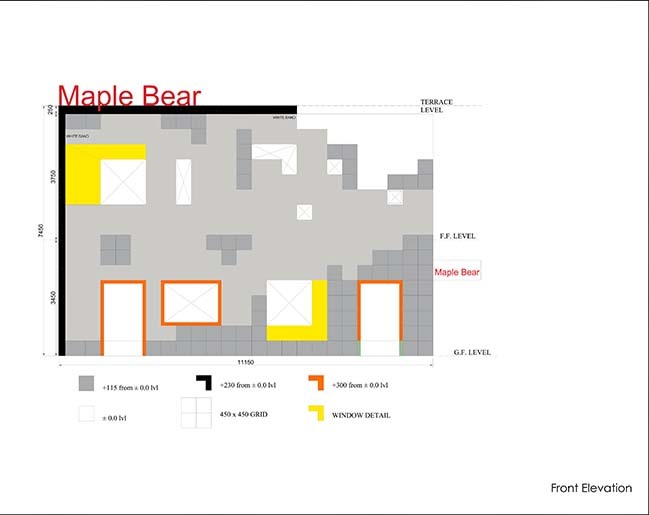 Thinking the space in this direction, suggests a prepared environment for the child in which there should be elements proportionate to their scale, that allow to direct the child to knowledge. 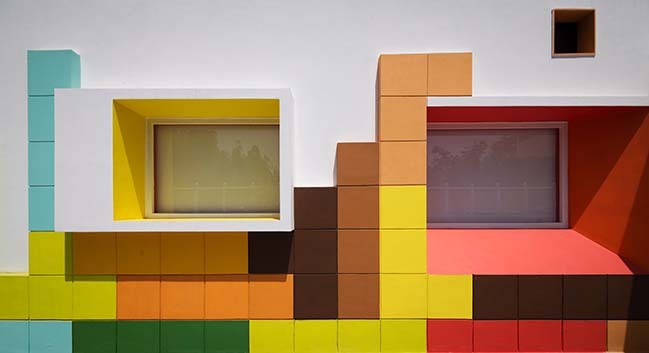 The objects should not be many, but the just and necessary quantity for learning. 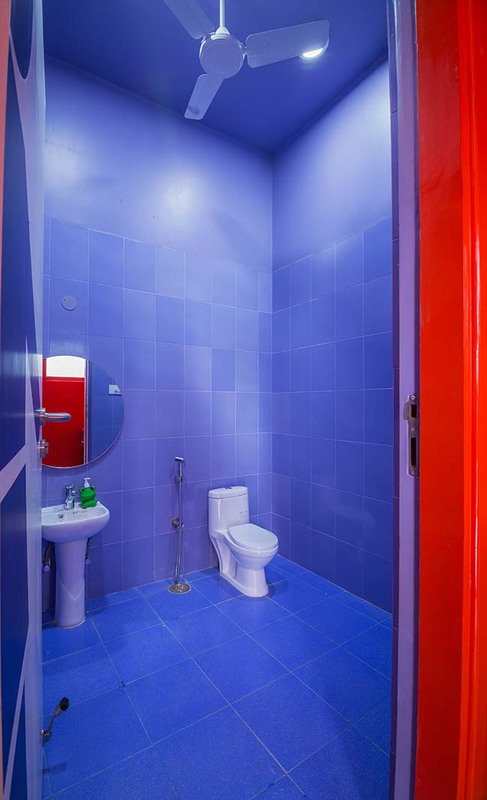 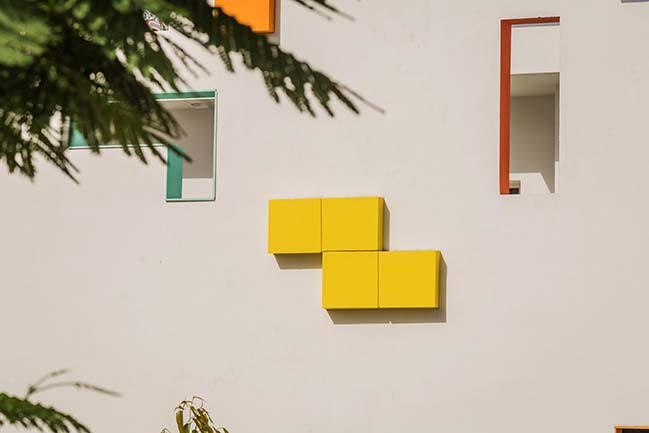 The elements and their forms must be simple; The space, easy to keep clean, without elements that stand in the way of the environment; In such a way, several activities must be able to be carried out simultaneously. 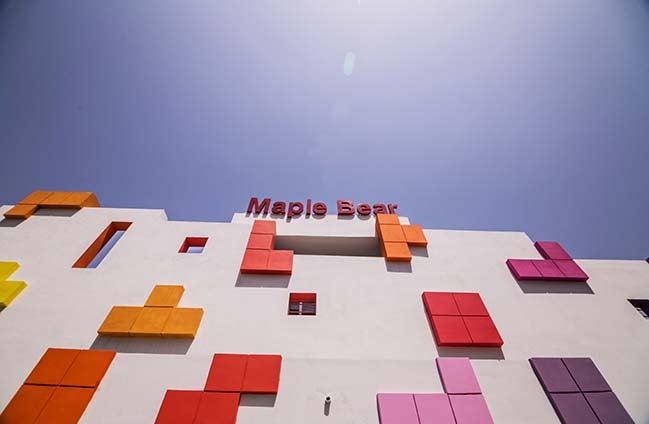 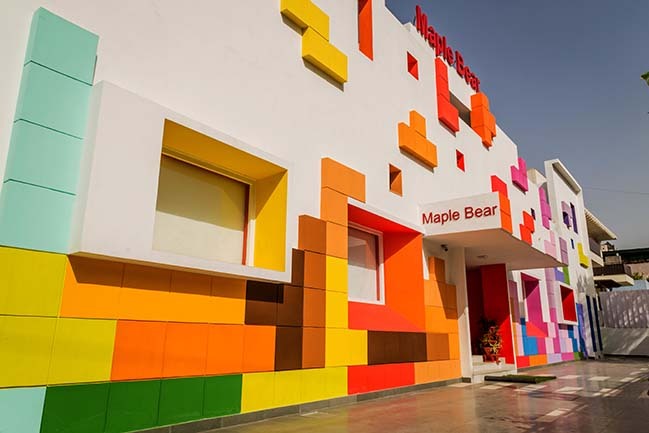 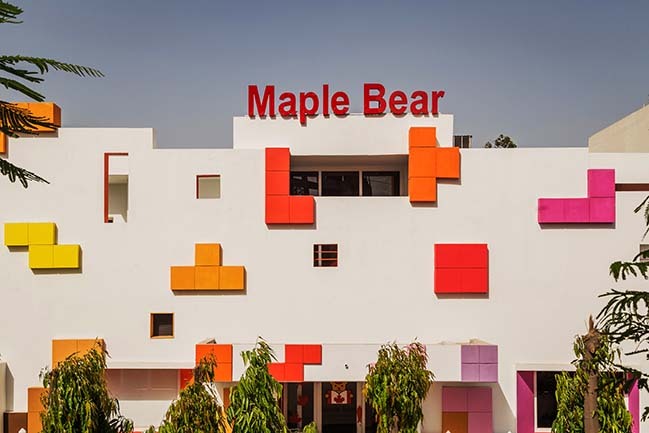 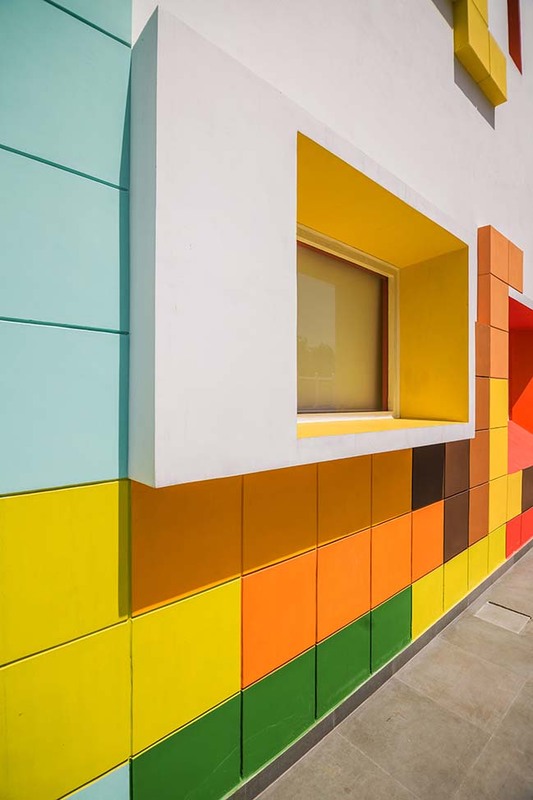 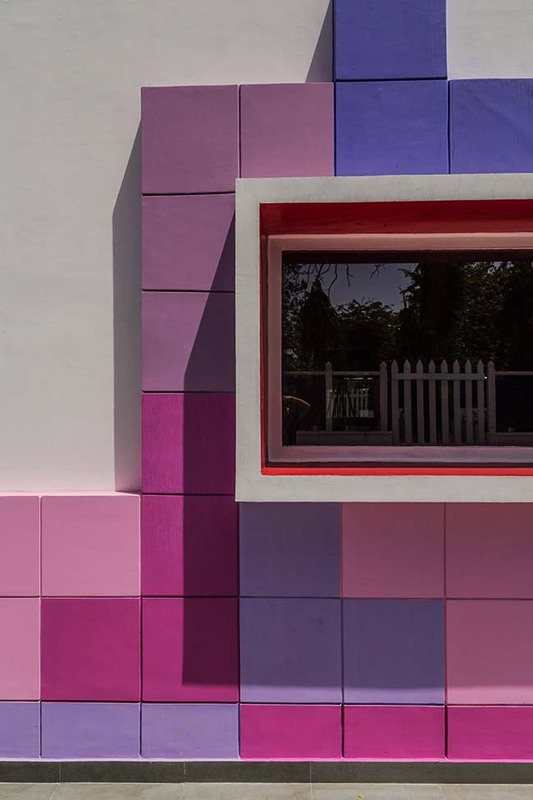 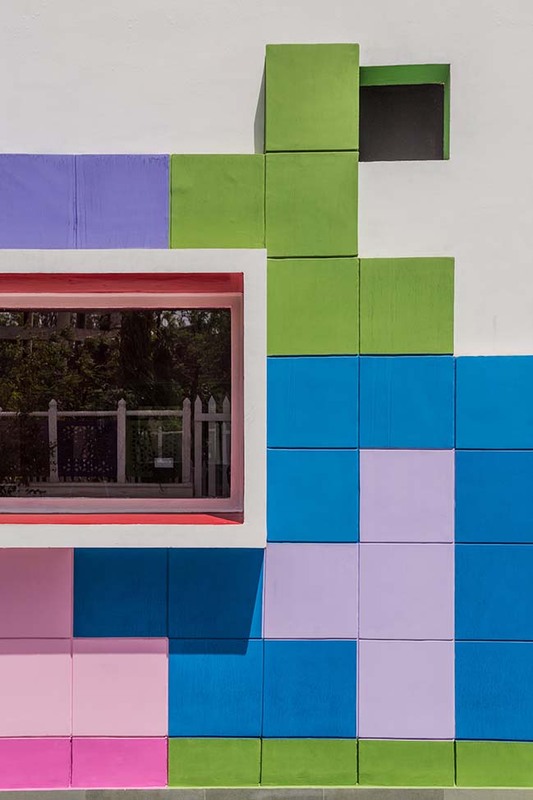 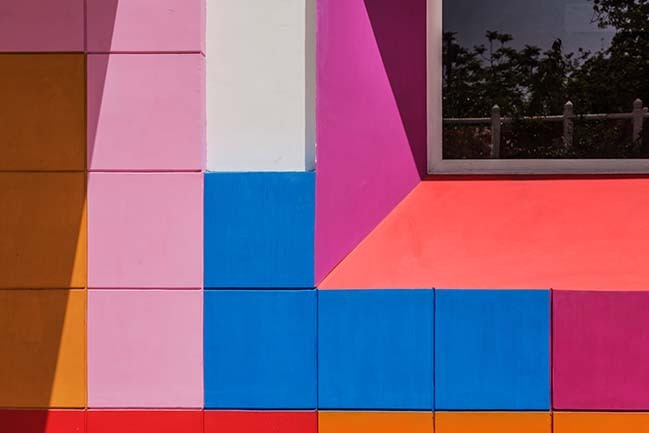 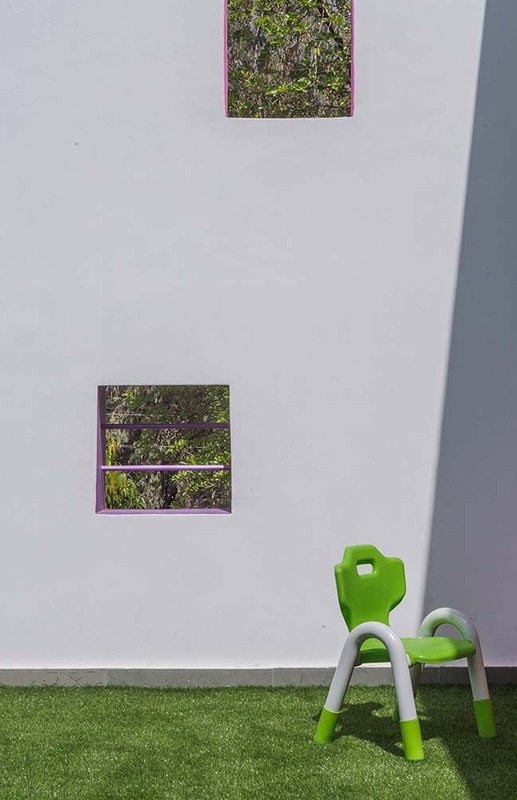 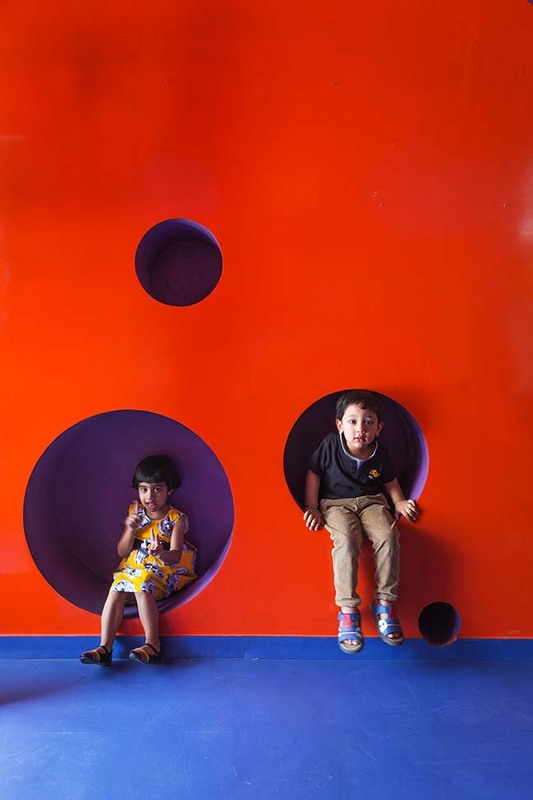 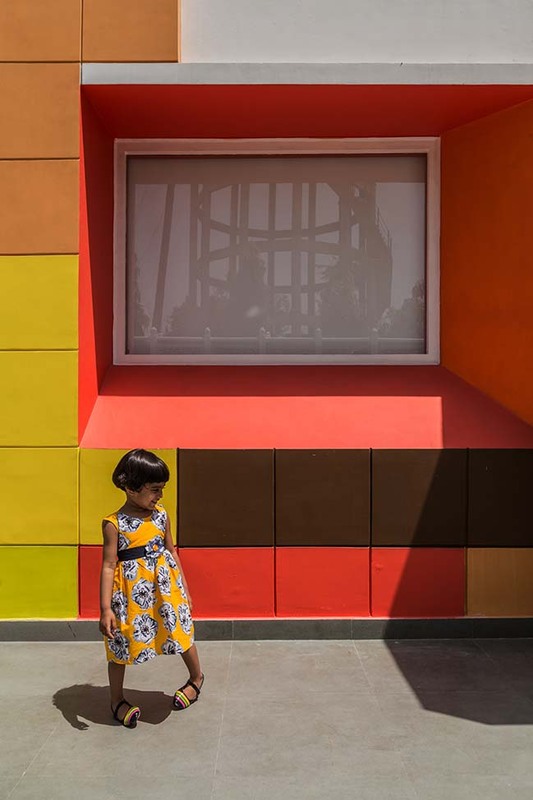 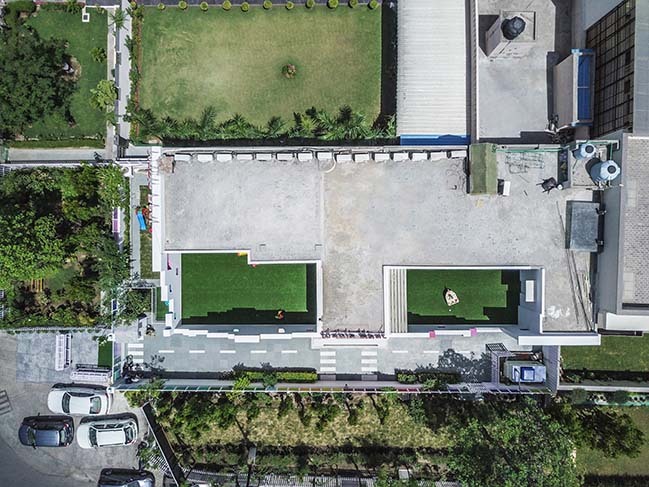 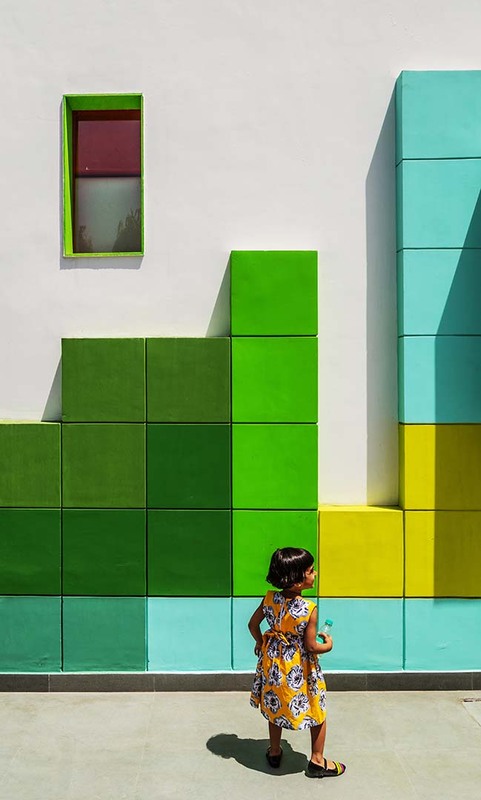 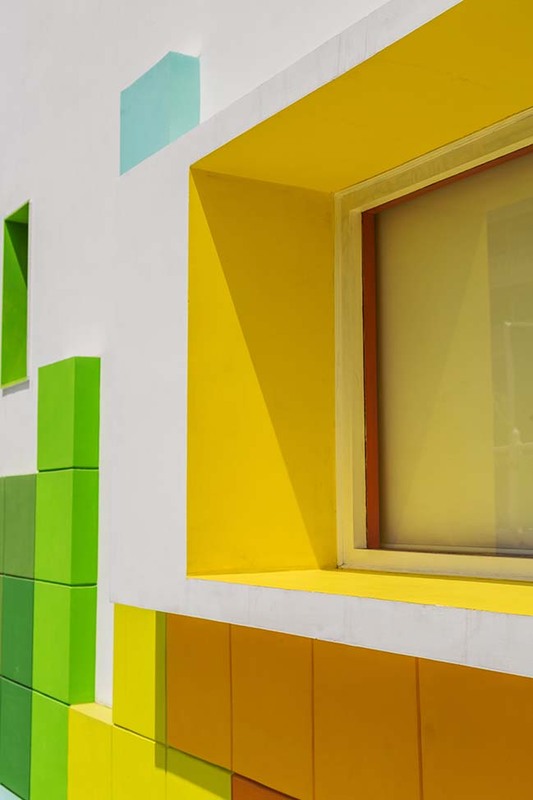 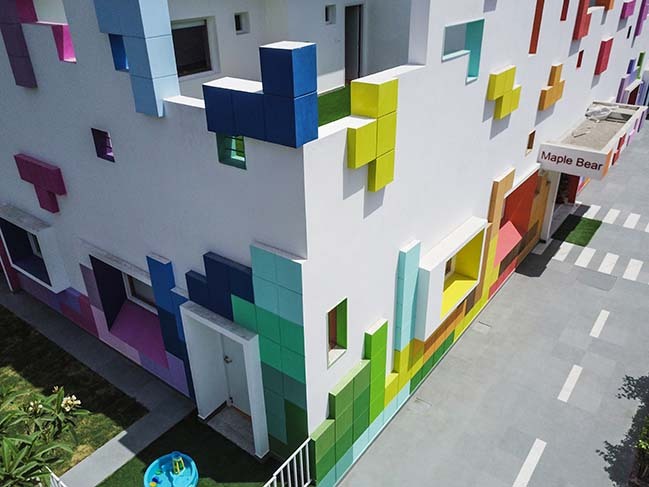 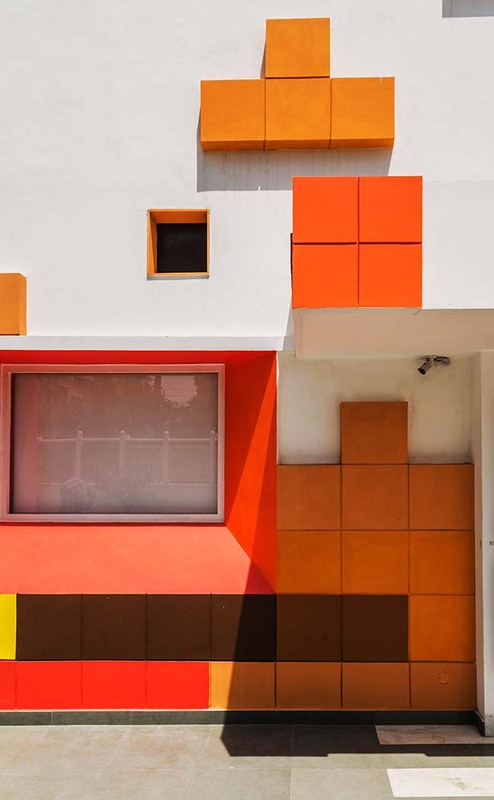 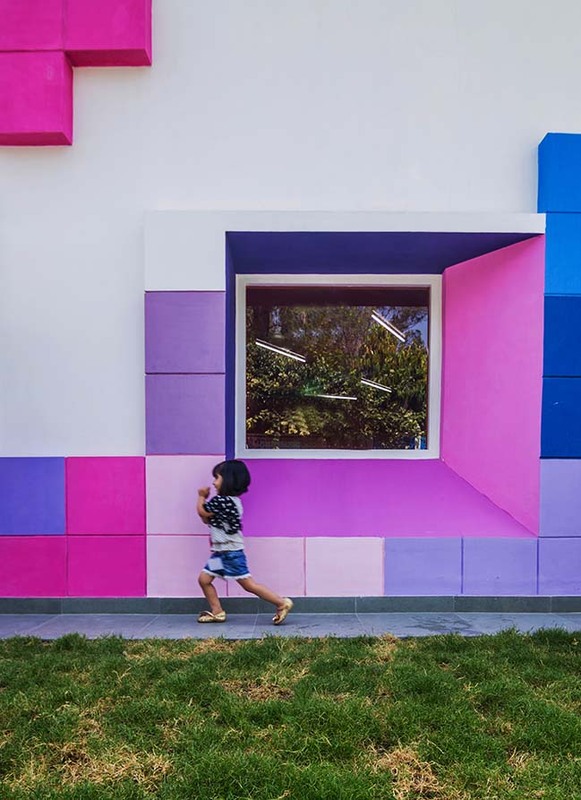 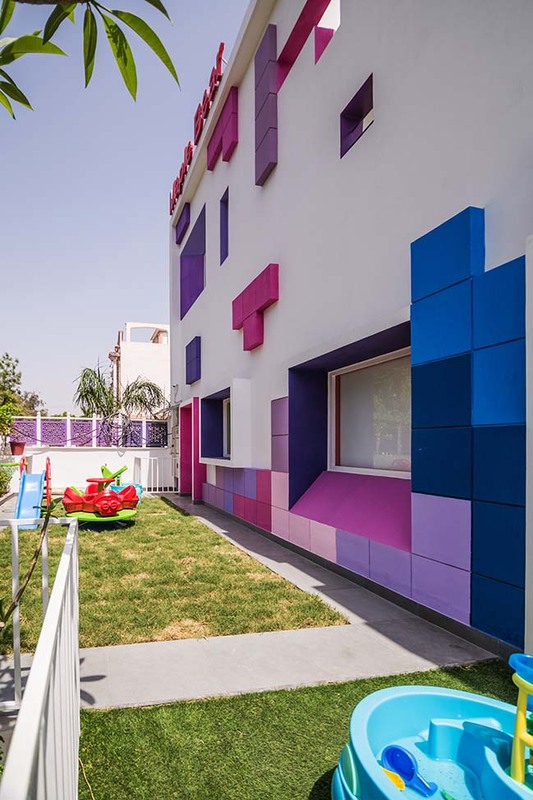 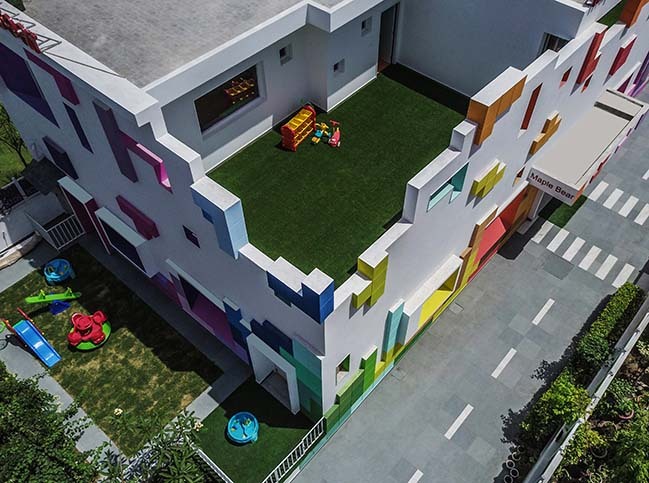 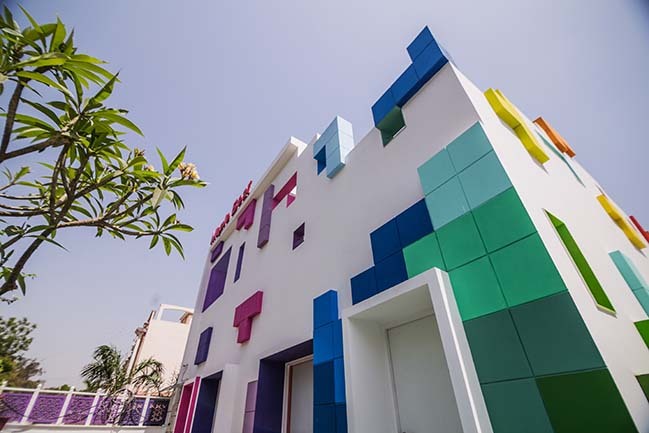 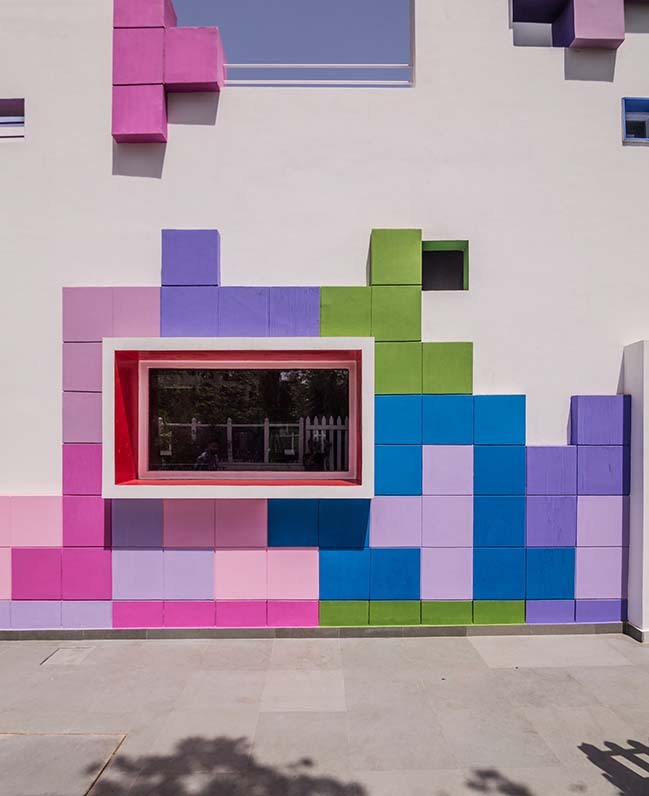 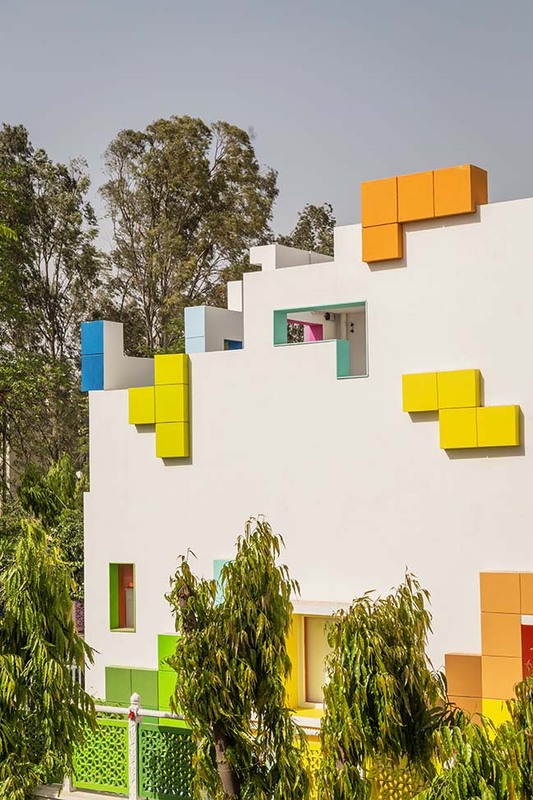 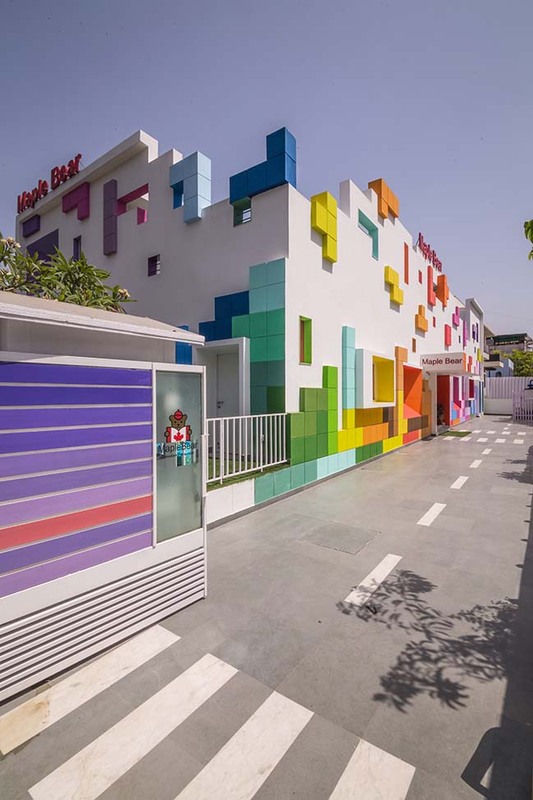 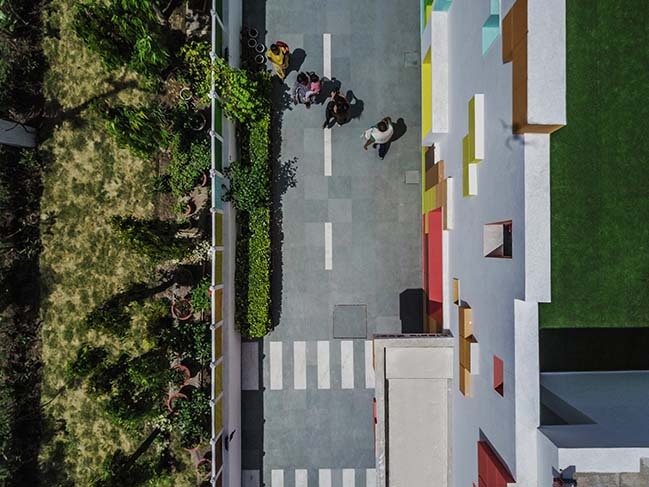 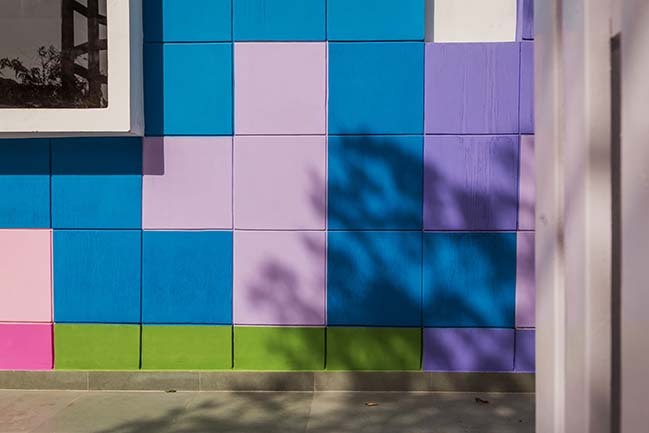 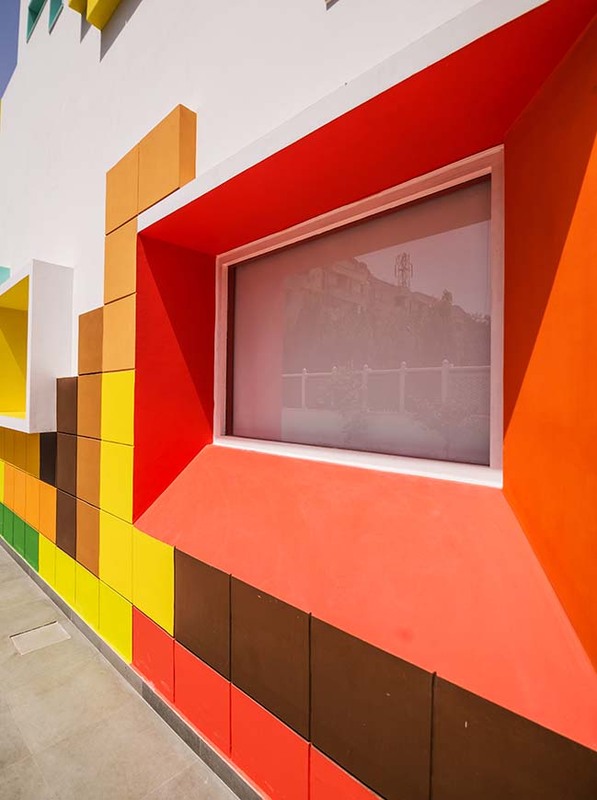 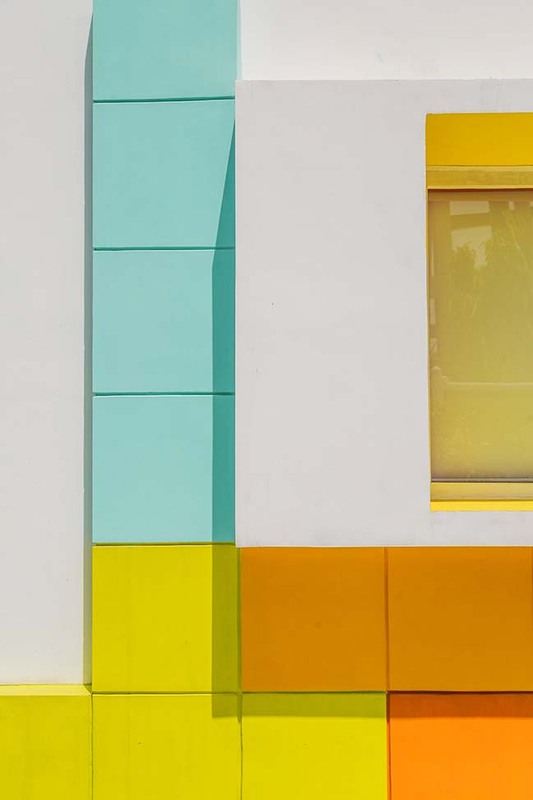 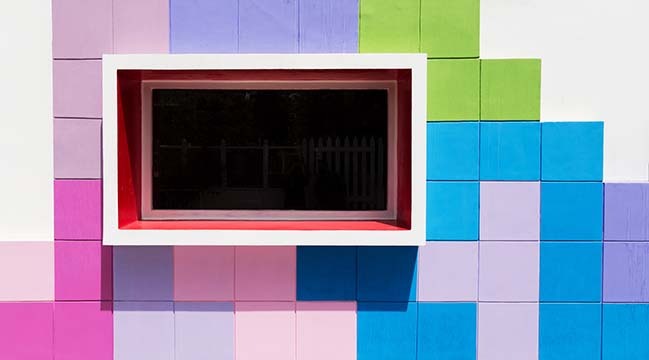 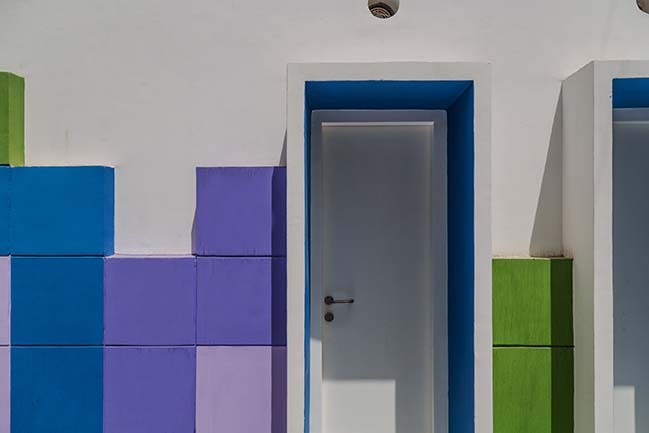 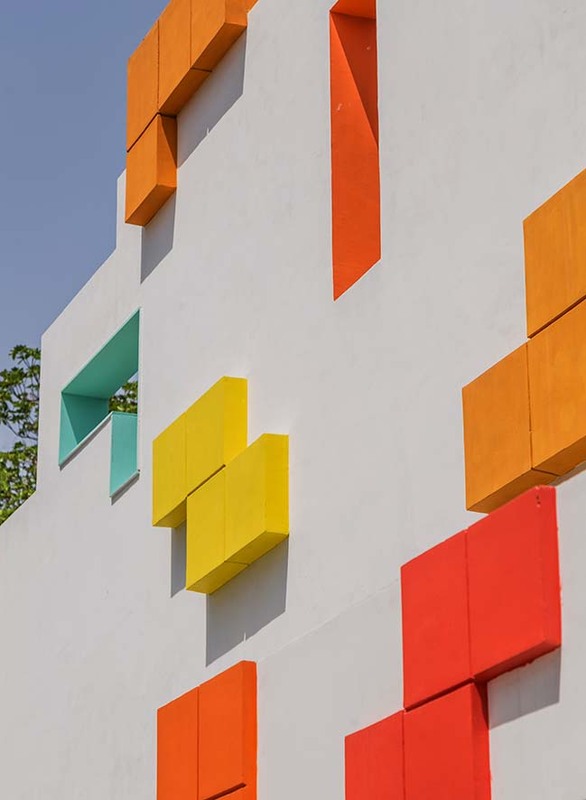 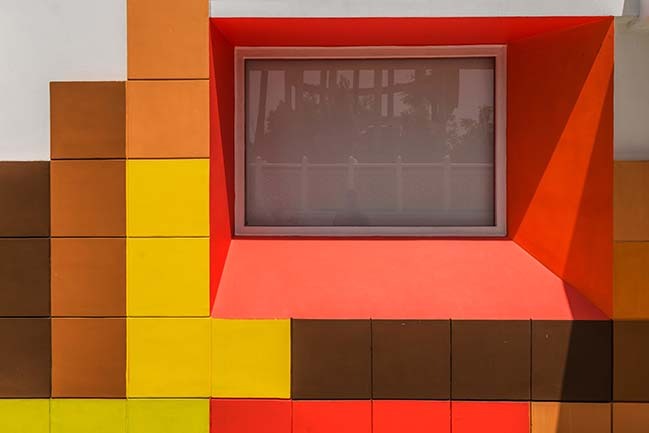 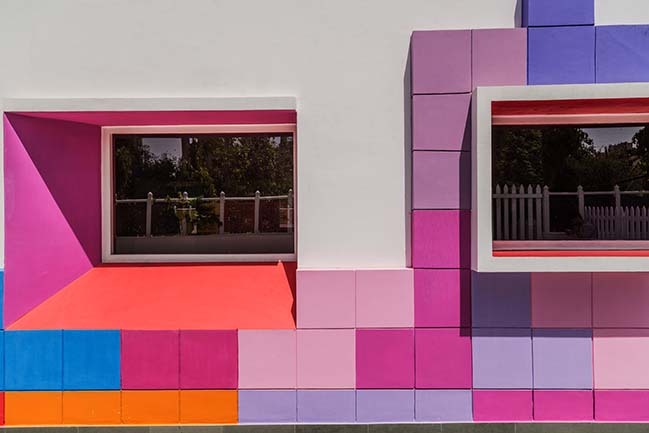 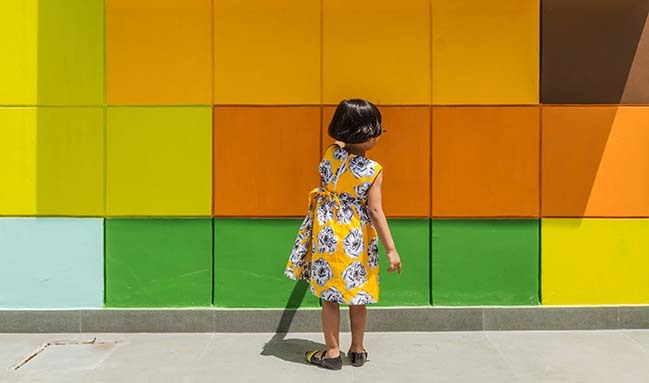 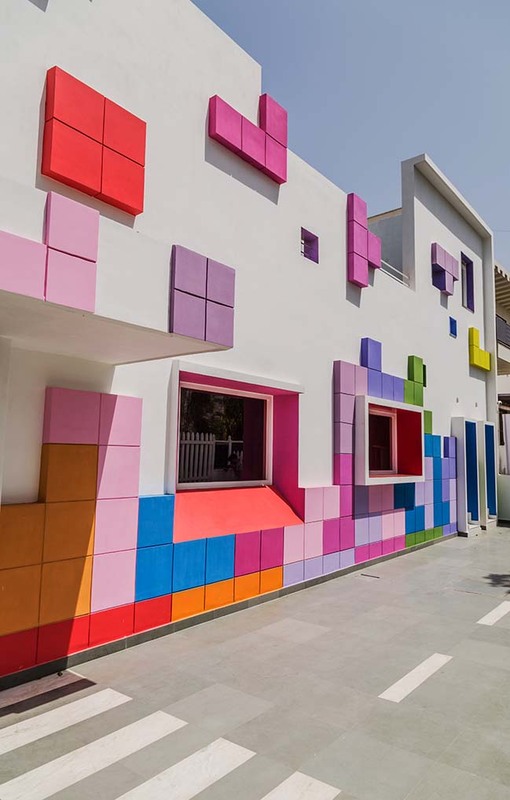 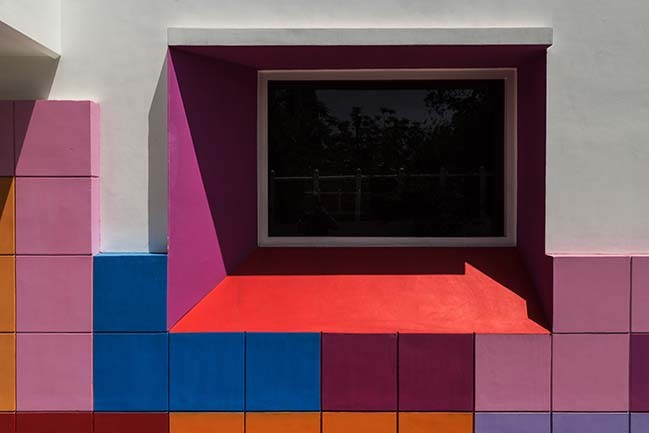 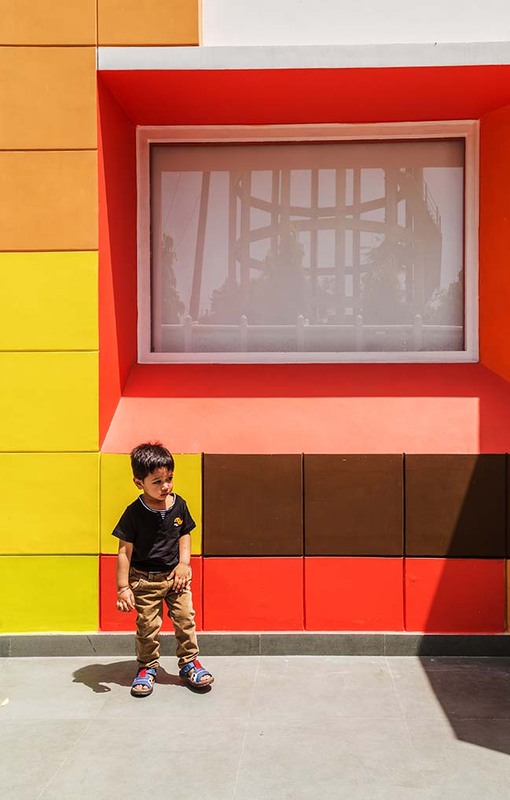 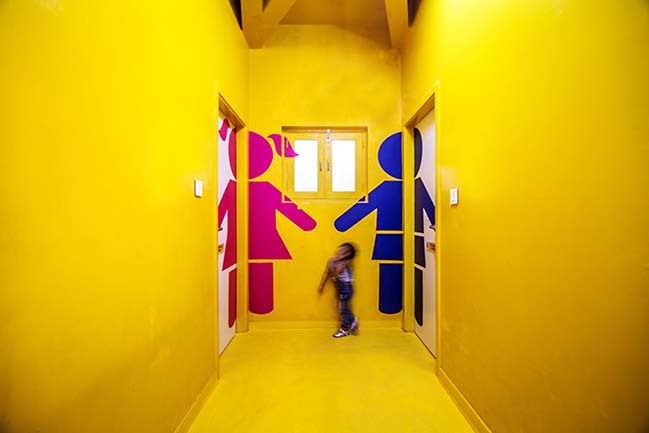 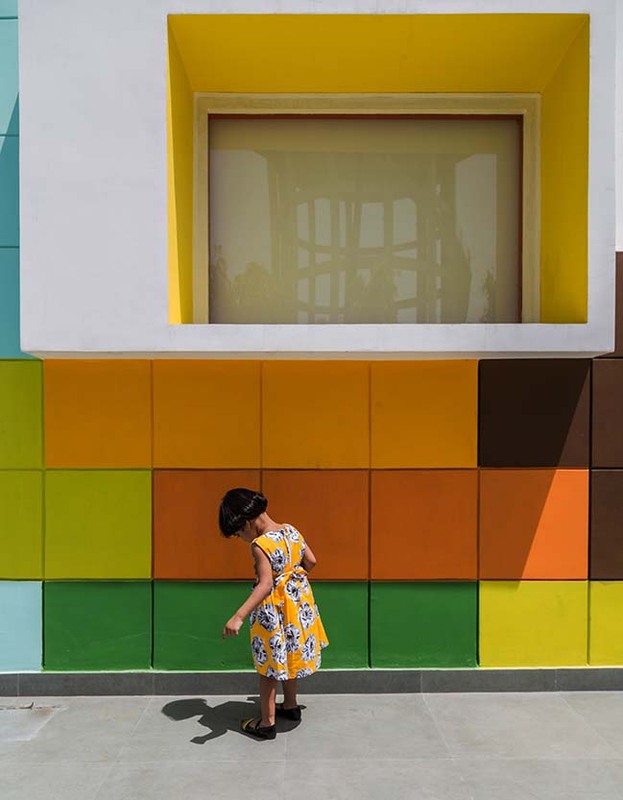 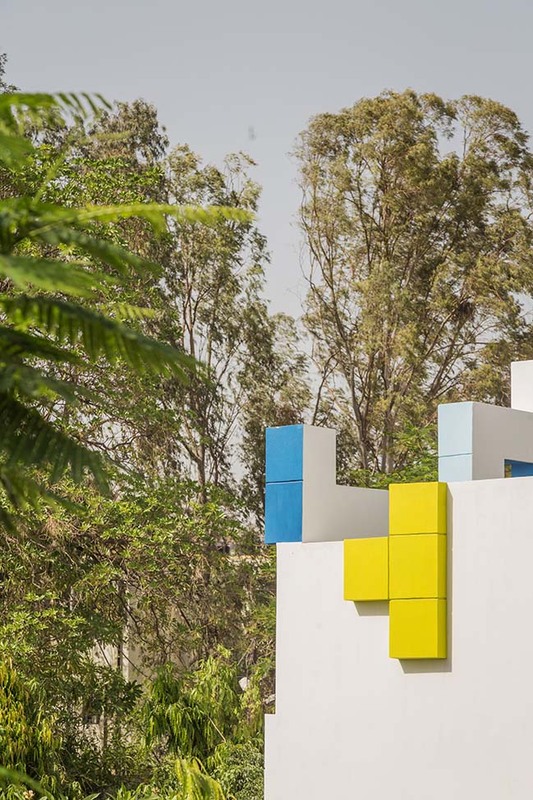 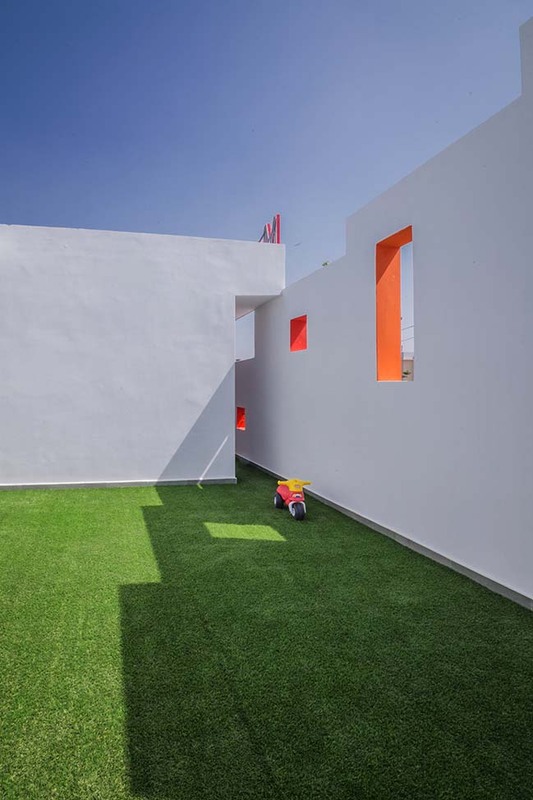 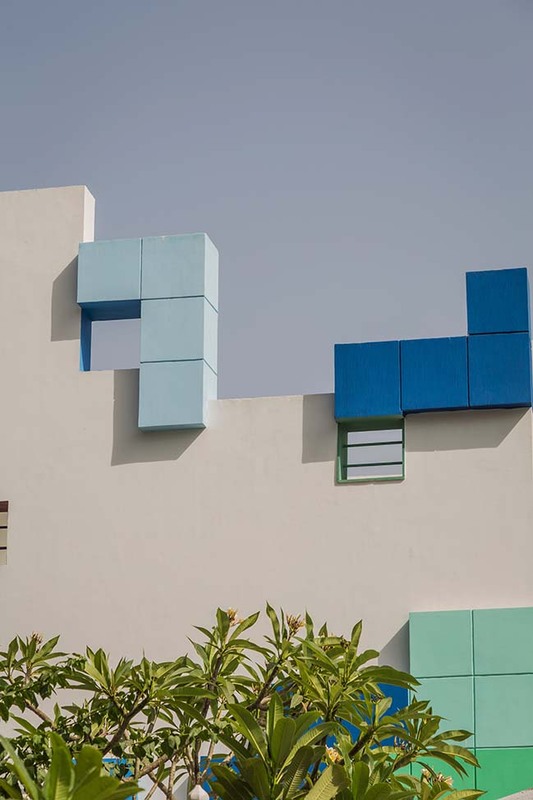 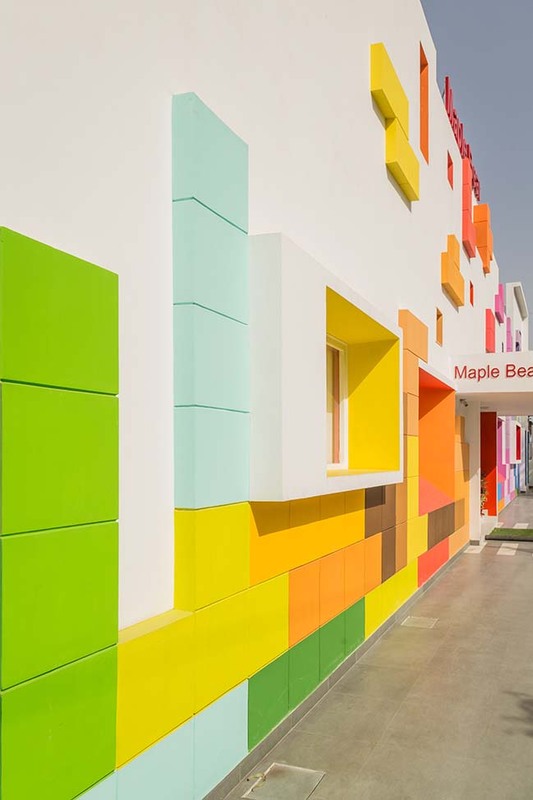 An old dilapidated residential structure has been carefully transformed into a pre-school- where the colourful tetris-ized facade ideology along with open learning environment enables children to interpret the flexible space and use it as they see fit. 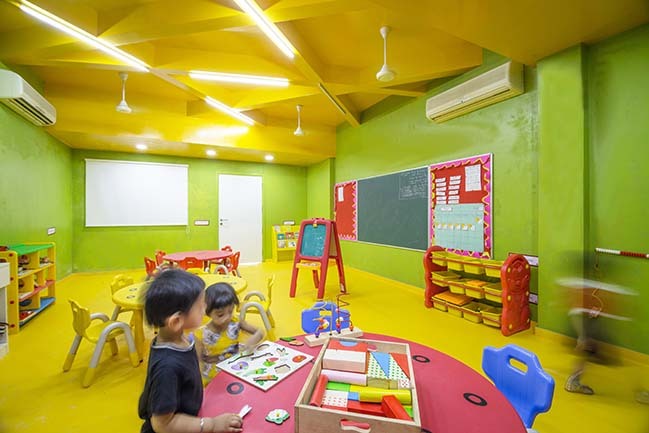 Questioning the idea of traditionally designed pre-nursery schools where learning is restricted to just four walls to hamper the holistic growth. 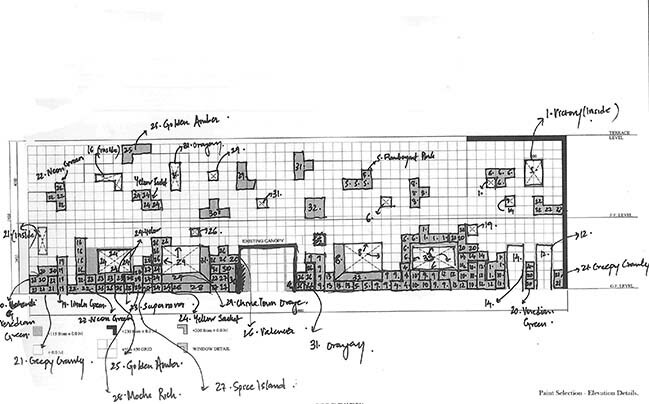 Renesa Architecture Studio went through an intense design scheme scan on the required elements which would force a reaction out of a young kid , hence came up with a design mapping of all the games the kids would play in that age group. 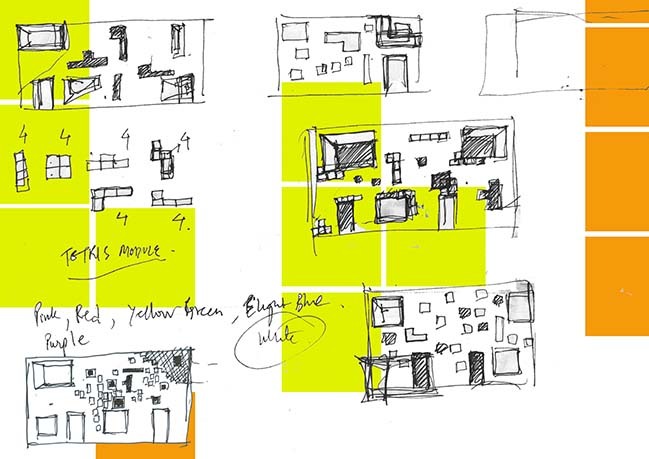 Finally reaching to a stage where the Tetris game could be clubbed with the architecture of the skinning of the area. 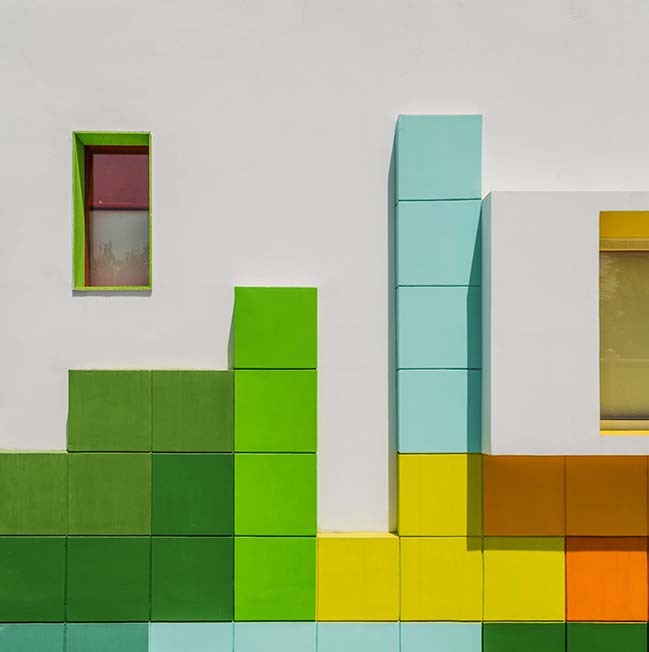 The old dilapidated structure needed a layered outlook with the Tetris design elements adding the right color and volume to the architecture as well as the minds of the little ones. 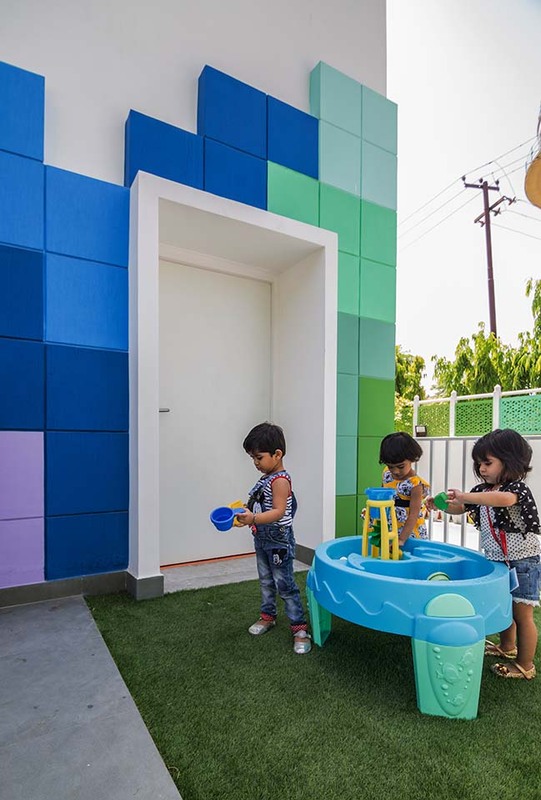 Playing Tetris on the facade creates an everlasting impression on the minds of the parents as well as their kids and hence the learning for the kid starts as soon as one enters from outside and slowly taking that learning process inside the complex too. 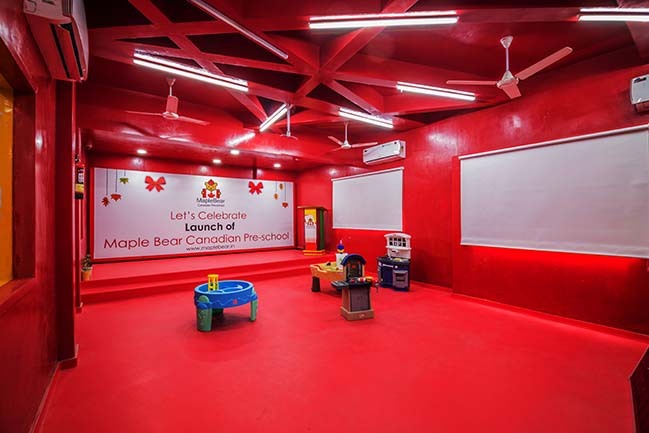 The existing building's structure was modified structurally in order to create more space and ventilation for the required classrooms and common areas. 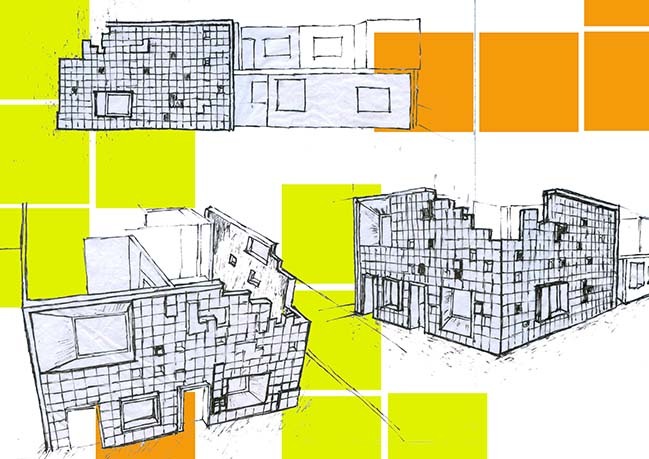 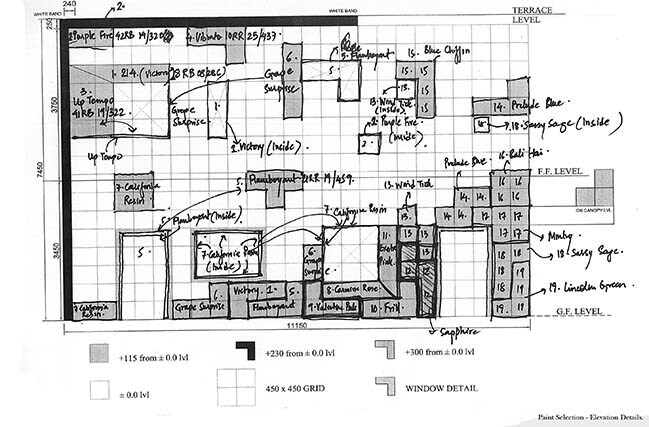 The walls were shifted in accordance to the allowable bandwidth of the existing building and was later joined into the external Tetris-ized layer wall in order to keep the structure strength intact. 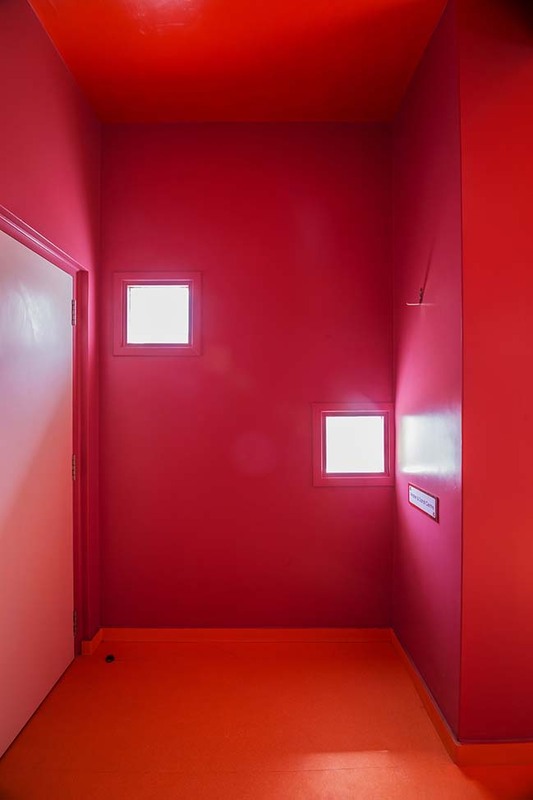 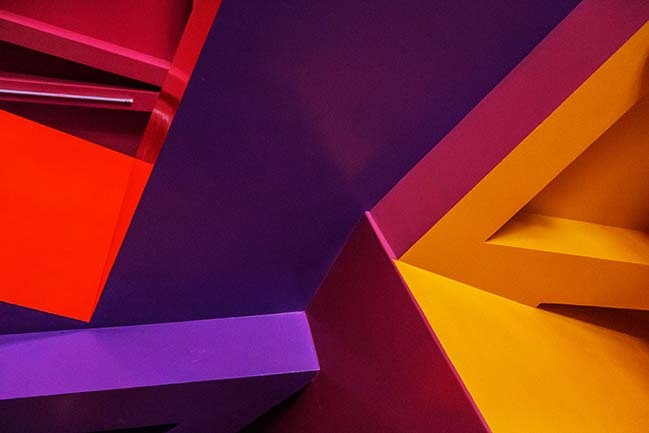 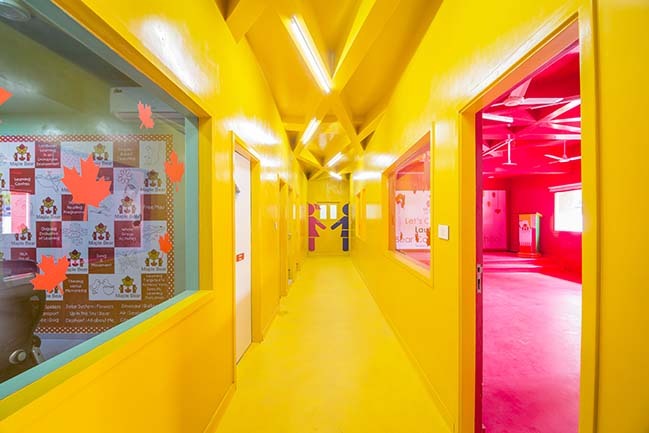 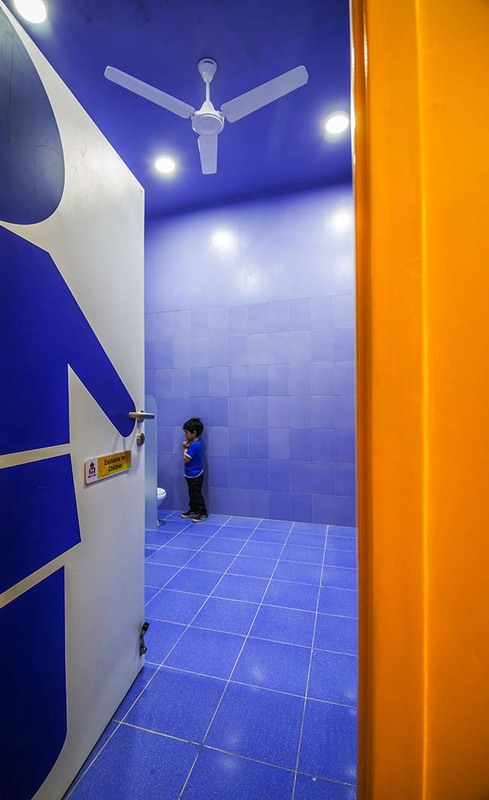 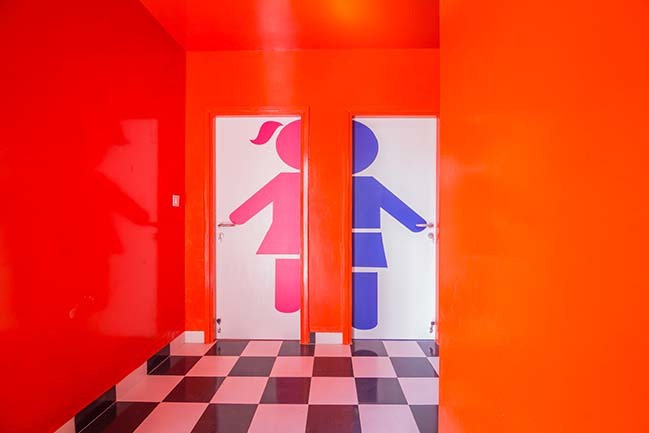 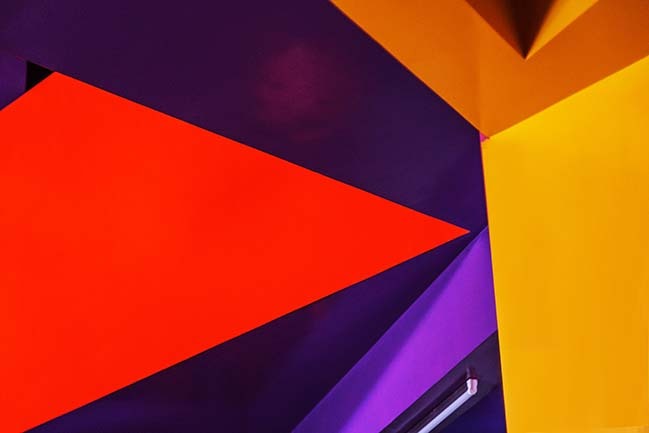 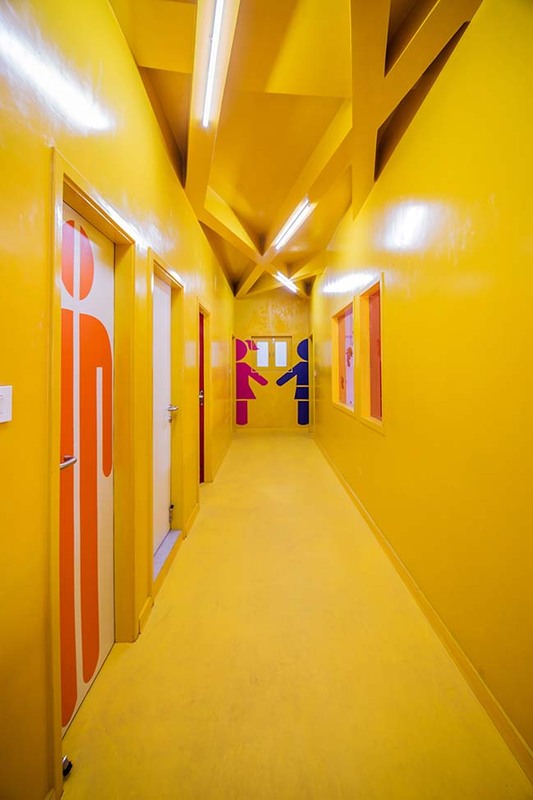 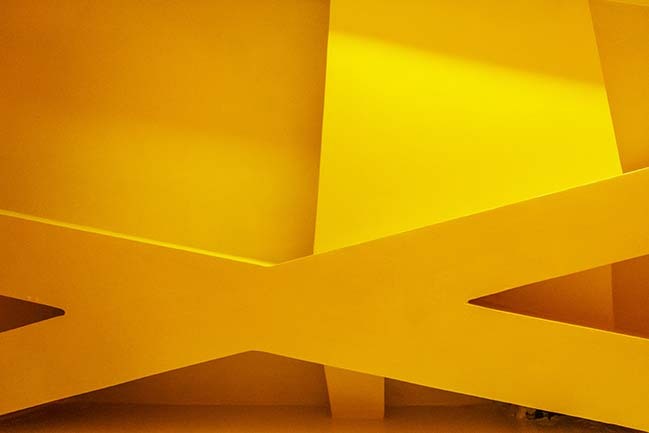 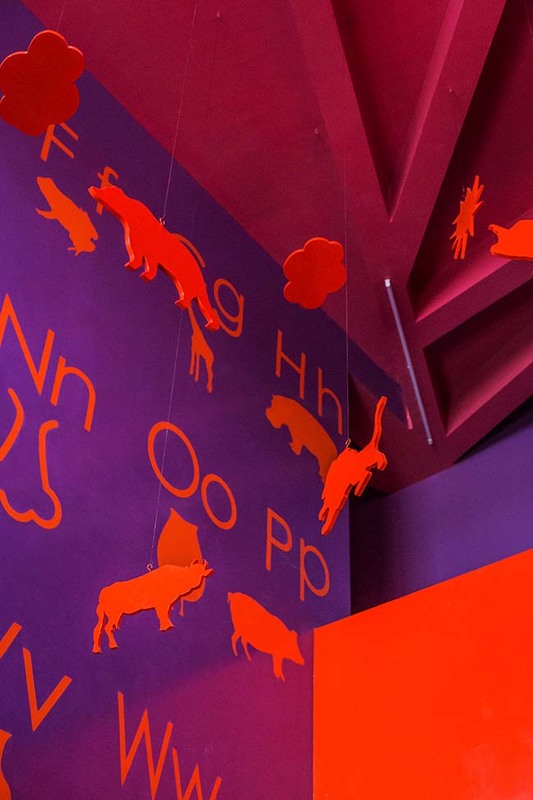 The strategic and consistent use of color establishes a stimulating and playful identity for the campus, acting as a visual connective tissue throughout the children’s daily experience. 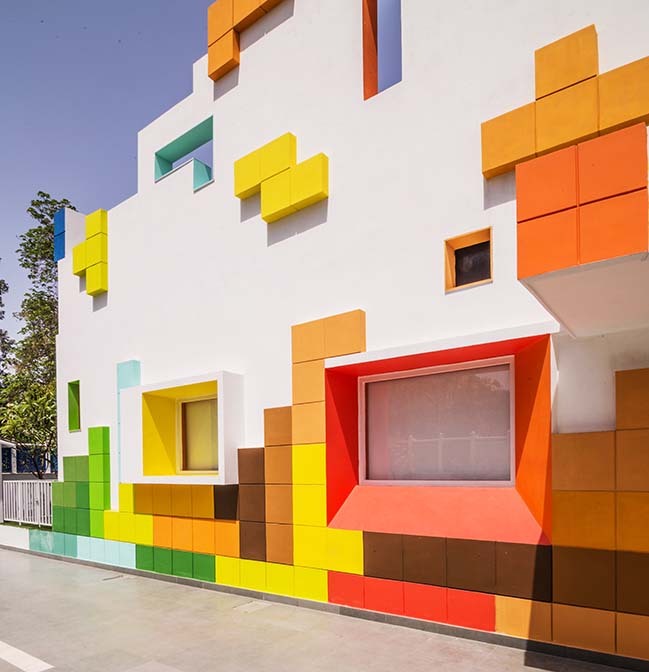 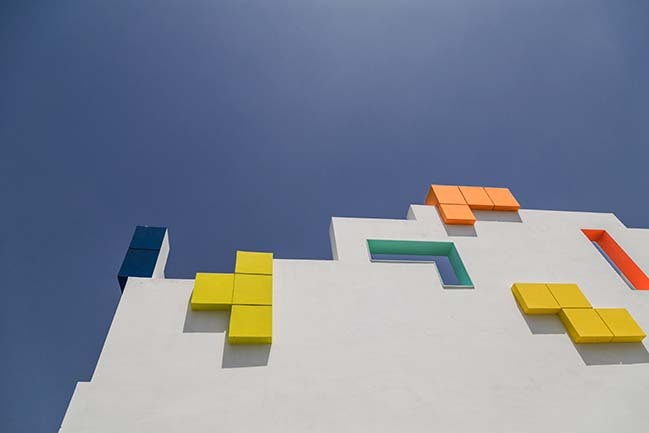 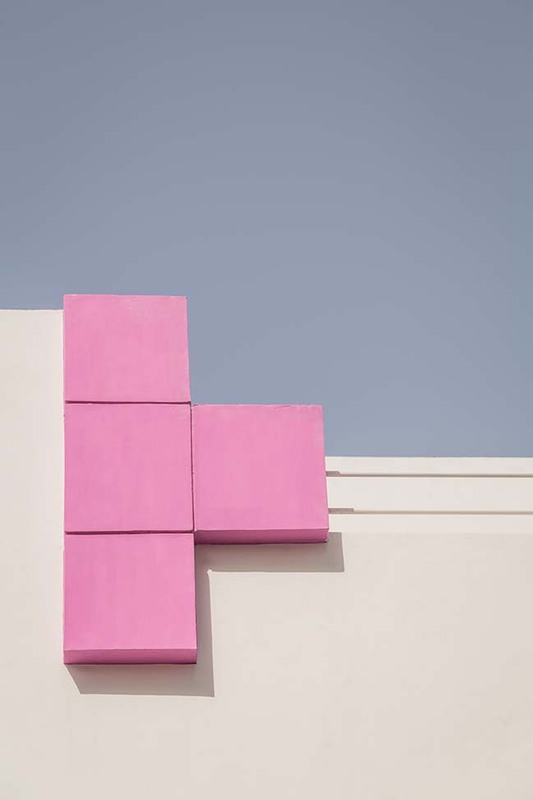 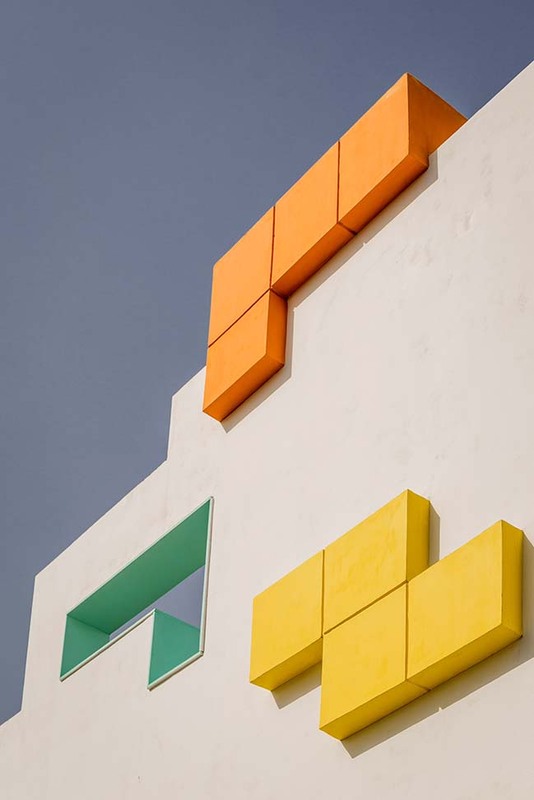 A running gradient of colors on the tetris-ized facade creates a value-addition to the already playful facade. 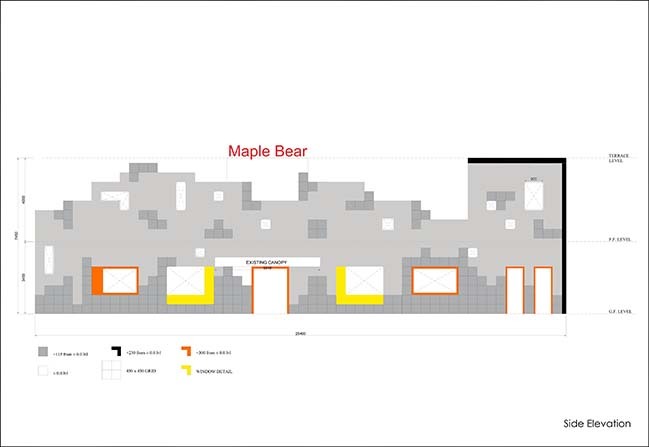 The Architecture was simplified to engage and be free of clutter to ease the interaction between the built environment and the natural surroundings. 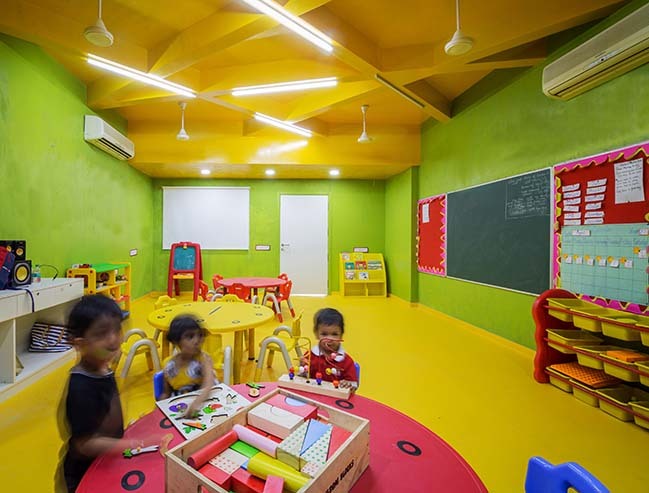 Due to cost and major structural constraints the existing building frame and shell were left intact though exceptions were made to create additional links between interior and exterior spaces and to highlight the main concept of learning through built ideology. 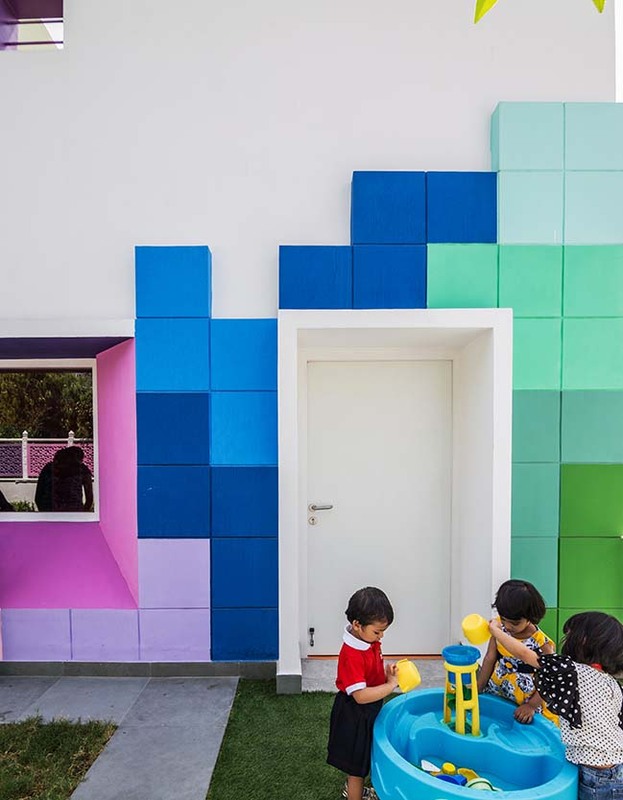 Within this predefined framework, playful architectural interventions occured(tetris architectural brick volumes) at the children’s scale, creating reading nooks between classrooms, formal/impromptu seating areas and sculpted terrain. 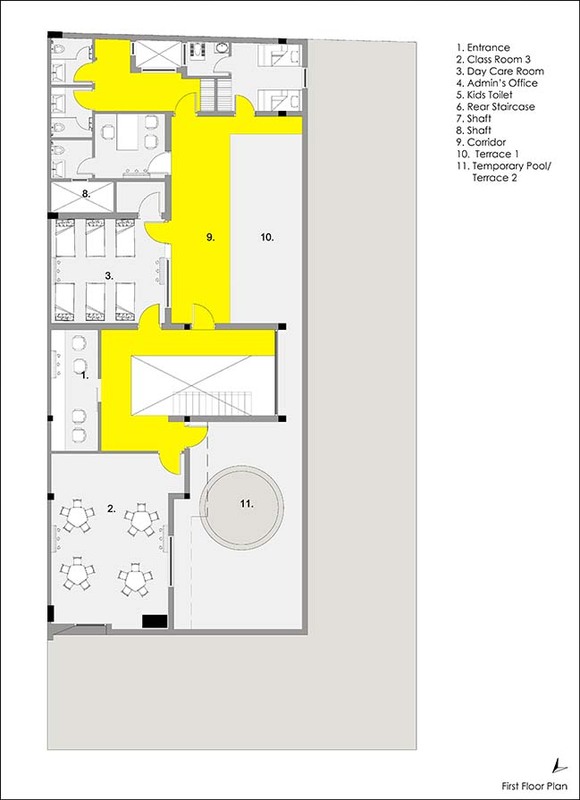 In order to provide three decent sized classrooms with a big discovery room(hall) along with the playground and sand pit arena helped Renesa Architecture Design Interiors find the right structural changes in the existing building and provide the right social environment that supports constructivist educational philosophies and pedagogies. 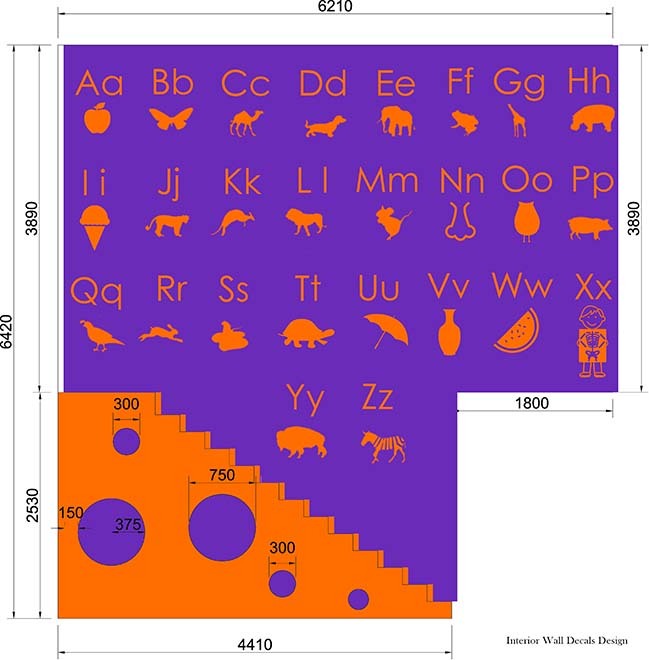 The world keeps changing .The ways of communicating, of learning, of moving evolve . 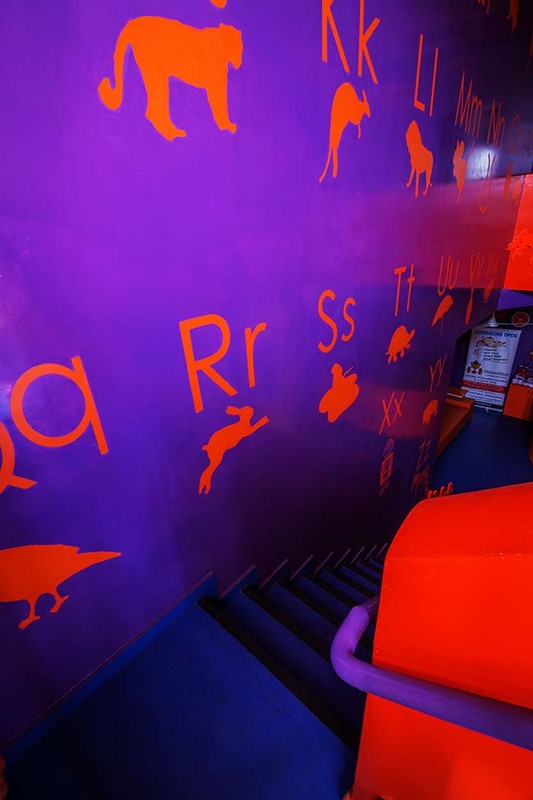 Education is not far behind. 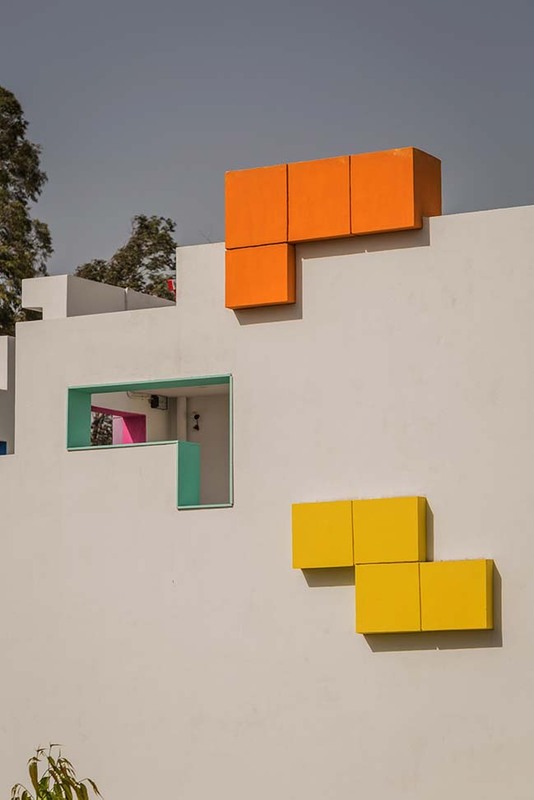 It responds to this continuous movement of transformations. 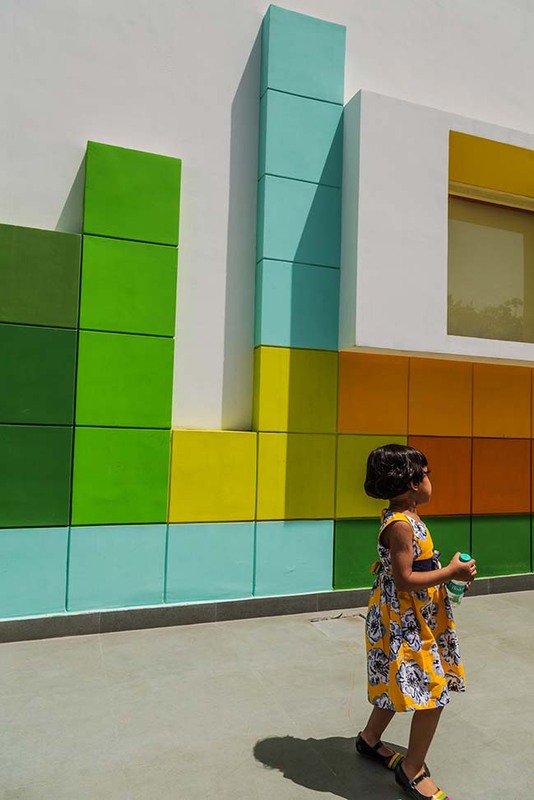 Architecture must accompany them; Create spaces conducive to education, spaces capable of transmitting emotions, generating belonging, and facilitating learning in its most natural and simple form.